Performing arts in India look back upon a common yet richly diverse tradition. Diverse classical dance/dance theatre styles that we know today as Bharatanatyam, Kuchipudi, Odissi or Kathak, emerged as distinct styles based on regional aesthetic preferences and the context in which dance was practised. While they can be traced back to ancient dance treatises, the earliest being Natyasastra (ca. 3 BC – 5 AD), every period in history, every decade, every practitioner and every context has brought changes, thus contributing to a practise that perpetually evolved and continues to evolve even today. In the past these various forms were brought to perfection, in particular, in the temples and/or courts of the respective regions. Today they have reached global relevance, with ever more practitioners of various backgrounds learning and perfecting the art. What makes these dance traditions relevant even today is essentially a well-defined structure, that has withstood the pressures of time, with a continued practise over time moulding and re-defining it. That is the transformative power of dance itself. This is particularly evident in the dance style Bharatanatyam. I recognise in the aesthetics of the classical forms, insights into movement and expression that can be defined in most contemporary scientific terms. In the well-defined structures of these styles there is a profound knowledge of the human body and its ability to move and express. The rich diversity lies in what aspects of movement each style has emphasised in practise. And that there is a body-mind connection and even more, is an integral aspect, in fact the side effect of the very practise of such dance. Yet, there is often a whiff of exoticism engulfing what is called Indian dance in Europe. My work over four decades has thus taken a triadic approach – innovative stage productions, teaching and research, to enable a critical understanding of this rich and, yes, loaded dance tradition. While content and context may appear to be rooted in specific cultural or religious practises, I recognise how the essence of its form can contribute to an understanding of human movement and expression at its core. That is what makes it universal, revealing itself to be beyond all categorisations when one gets on to the floor and practises it. Classical forms are not trendy forms. They evolve in the body over time or a life time and enable deep and rich experiences. Bharatanatyam is the name given to a dance form that evolved from the 18th C in the court of Tanjavur, Tamilnadu. 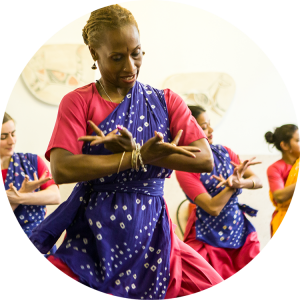 Its repertoire as practised today was developed by the Tanjavur Quartett, who were dancers, musicians and scholars at the same time. Central aspects as in all classical forms are nrttta and abhinaya, the non-narrative (nirgiti) and narrative aspects of dance respectively. Continued to be reflected in several subsequent treatises such as the Abhinaya Darpana are later practises of using the stances, gaits, gestures of individual body parts, glances, facial expressions and more, that have been laid down in Natyasastra with detailed knowledge of the body. They are the basis for Bharatanatyam. This dance style is known for its linear precision and subtle expressivity that emerge from a complex integration of movement of hands, feet and eyes. Hallmark of Bharatanatyam is the grounded aramandi-stance with deep femoral flexion and gradated rotation. It is the position in which not only all movements have to be executed, but also gain their agility and grace. Rajyashree Ramesh offers a unique teaching methodology that highlights these aspects, her pioneering work placing them in the context of modern movement research. The systematic training developed over several decades of teaching learners from all over the world, takes practitioners from the simple to the complex, from individual movements to whole body integration, from form to fluidity, from body functioning to expressivity, from stability to mobility, from the rhythmic to melodic aspects of music, from body knowledge to philosophical background, and much more. 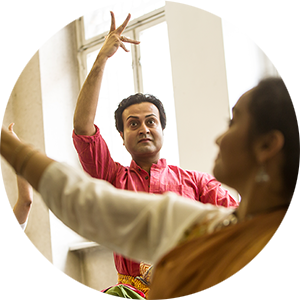 The aim at all levels – from Beginners to Advanced to Professional stage performance – is not just to imbibe a specific dance tradition like Bharatanatyam, but the practitioners ability to go within and bring forth outer form to achieve a deep understanding of its relevance for one’s own practise in today’s context. Every class from pre-basics to advanced professional training is an exploration of movement and expression. Apart from adult courses, kids courses for age groups, 4-6 years and 7-11 years are offered. Learning dance and movement are important aspects of early education, as more and more studies reveal. 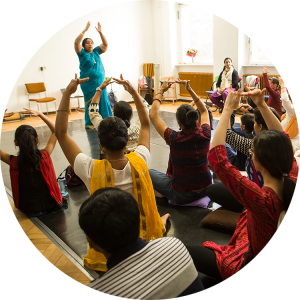 Central in the courses are therefore both a playful and creative approach to the gestures, postures and movement of Indian dance theatre, as well as a systematic movement analytic introduction to Bharatanatyam from the age of 7 (or 6 if children show aptitude). Courses 2019 - April-June + Sept.-Nov.
* After the registration deadline, we may give away some rest places. At the Global Music School we want to expand our dance department. For this we are in contact with various qualified teachers. However, the expansion of our dance department also depends on the demand. Therefore, if you are looking for instruction in other dance styles, let us know. We will gather the interested parties and bring you into contact with our teachers.